These OC coils are replacement coils for the Vaporesso Orca Solo only. These traditional coils have a resistance of 1.3ohm and deliver fantastic flavor from your high-nicotine juice or nic salt juice. Vaporesso OC Coils come in a pack of 5. The Vaporesso Orca Solo is a slim all-in-one vape kit that’s perfect for users of high-nicotine juices and nic salts. Thinner than the width of a dime, the Orca Solo by Vaporesso has a pen-style design and has an integrated 800mAh battery that provides great battery life. The Vaporesso Orca Solo’s battery supports 1A quick charging, and can be recharged in just 45 minutes! Despite its minimal design, the kit utilizes Vaporesso’s Omni Board Mini technology, which provides smart flash heating for quick and even heating. This delivers consistently smooth, rich flavor with every inhale. Omni Board Mini technology also provides a range of integrated safety features, including short circuit protection, overheating protection and low voltage protection. The Vaporesso Orca Solo has a simple top-fill system so you can top up your vape juice easily wherever you are. Simply remove the metal tank sleeve and squeeze your juice into the tank, making sure not to get any in the central airflow. The Vaporesso Orca Solo is optimized for use with high-nicotine and nic salt juices, and comes with a choice of 1.3ohm CCELL and traditional coils so you can find the perfect one for you. The Orca Solo’s tank holds 1.5ml of your vape juice of choice, giving you around 190 puffs per tank! 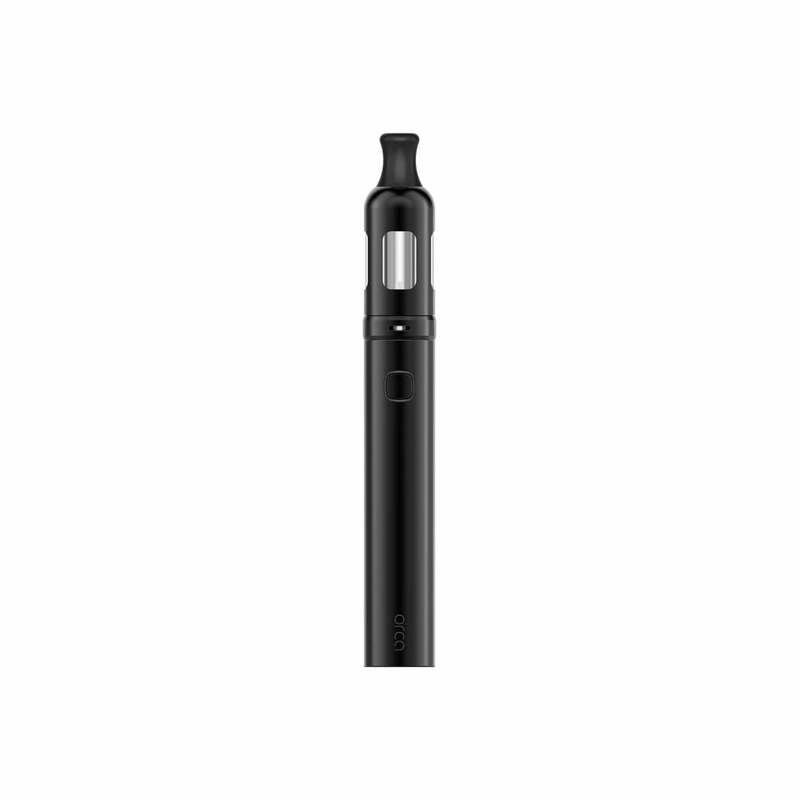 Perfect for beginners and mouth-to-lung enthusiasts, the Vaporesso Orca Solo is a compact, easy-to-use kit with impressive performance and great flavor production. I really like this design, but after 3 weeks now I can't get it to work. It won't charge, i can't get it to work. Lucky I still have my resolve stand by. Feels very solid in the hand and would also give good flavor and very dependable. I'd been using the myblu device for ages, and then got sick of receiving bad-tasting cartridges and getting no refunds. This refillable device is sooooo much better, so many more flavor options, and omg so much cheaper. Easy to use and maintain, battery lasts for ages. Glad I finally switched, but irritated with myself for not doing so sooner. Perfect for beginners and novices. Sleek design, it's identical to what is listed to the site, and for a sweet sale price for a starter kit, simple to use. I had chosen the rose gold colour. I'm happy that it doesn't leak either nor do I have to worry about the top breaking, as it is encased in metal material (which had happened to me with previous shops & their products.. that had lead me to smoking again). The order came with a free tobacco ejuice, which is also a plus. So far, a little over a week cigarette smoke-free & counting. Thanks, this has been helping me stick to my goals so far of quitting smoking again. Nice design, easy to use, doesn't leak, and I rarely have to charge it. Lovely colour selection. I had chosen the rose gold. I tried this product and now cant get my money back, it's been too long. The top went unscrew. I haven't been able to use it since I cant fill it up. The design of the glass that secures on is not easy to figure out nor is it ideal when you go to refill it. I bought this for a back up and I'm now sorry I did. Easy to use, long lasting battery & fast recharging, good design & good flavor. This is my second one 'cause I broke its glass tube. I received my Orca Solo 2 weeks ago. The pen worked great and was easy to use. The taste was smooth. No hit to the throat which is what I like. However, this morning, the pen no longer holds a charge. Going to see what the seller is going to do.